Stereo Rent is a company with 30 years of experience in the audiovisual sector, specialized in organizing all kinds of events and renting audiovisual equipment. Today we want to present the features of a AV processor of last generation for quality presentations and live events. In Stereo Rent we have a processor of high range based on the LiveCore platform. It is a system of high processing capacity and Soft Edge, to achieve high level presentations with an output resolution of up to 4K. Versatile connectivity for a next-generation processor that allows you to adapt to the demands of the market. This powerful multi-display switcher with 32 scalers offers 42 input plug and also includes Dual-Link output for control effects with preview of all sources. In addition, up to 100 memories between frames and logos, as well as horizontal and vertical blending. 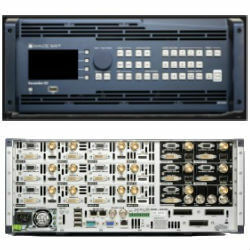 This system can handle any video source from computer to composite, and offers output to a variety of formats, HD-TV, PC and 4K. With a weight of 19 kg, this technology is perfect for the technical preparation of events and can be controlled from the front panel or remote software. The quality of this system makes it stand out over other processors and offers results that meet expectations. If you have any doubts, at Stereo Rent we advise you on this type of technology for your events.